Congratulations to Brittany Laflen, small animal surgery / neurology technician in the Veterinary Teaching Hospital, on recently receiving the award for Best Case Report at the American College of Veterinary Surgeons (ACVS) Surgery Summit, held October 12-14 in Indianapolis, Ind. She won the award for her case report titled, "Craniocervical Junction Foreign Body Causing Peracute Tetraparesis in a Young Dog." 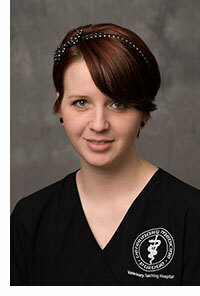 Brittany was one of up to five technicians selected to present at the ACVS summit. Submissions were open to credentialed technicians with limited speaking experience interested in an opportunity to practice speaking on a surgical-related topic at a national continuing education event. Along with her award, Brittany received a plaque and the Joel Woolfson Memorial Scholarship. Great job Brittany!